Champion Oil’s Blue-Flame “Classic” 15w-40 Diesel Motor Oil is a purpose-built diesel motor oil specifically designed to meet the demands of diesel competition builders, racers, and enthusiasts of turbo and super-charged pre-2007 diesel engines. On display at SEMA this year in the New Product Showcase and at Booth #21131, Champion Oil’s “Classic” Blue Flame Diesel Motor Oil is a unique hybrid synthetic blend 15W-40 diesel engine oil that combines workhorse high-zinc performance additives, superior protection, advanced polymer technology, and high TBN, supported by a carrier blend of synthetic and conventional base fluids. Why offer such a product? 2007 marked a significant change in engine design due to the emission reduction mandate imposed by the U.S. Environmental Protection Agency. Many fundamental engine oil protection additives could no longer be used in engines fitted with diesel particulate filtration (DPF) devices. It became clear that engine oil’s ash, sulfur and phosphorous content, and other additives were targeted for substantial reduction to meet new requirements. The current spec engine oils were designated for API service category CJ-4 to meet the normal driving conditions in post 2007 diesel engines. However, today’s diesel enthusiasts who do not have a DPF sought better protection and increased performance beyond that offered by a conventional CJ-4 lubricant. Performance diesel owners have reported increased cylinder, cam, and bearing wear in their pre-2007 model diesel engines, especially in competition diesel engines. Development by Champion included attention to the concentration and synergistic behavior of anti-wear and detergent additives in an effort to obtain more robust protection at high temperature and heavy load. Champion “Classic” Blue Flame also utilizes TVS® (Thermal Viscosity Stabilizer) polymer chemistry, borrowed from CHAMPION RACING OIL technology, and a dynamic backbone of enhanced shear stability and viscosity control. In addition, Champion “Classic” Blue Flame Diesel Motor Oil delivers unmatched high temperature film strength and lubricity protection, has the muscle to combat oil shear, maximizes and sustains cylinder compression, and is proven to increase compression, engine horsepower and torque. 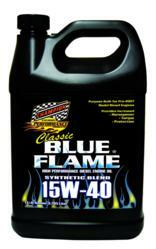 Champion “Classic” Blue Flame 15W-40 is purpose built for extreme protection and performance.